A corundum mine recently opened in Eastmarch near the base of the waterfalls of the main river, at the bottom of the cliff. A mining camp dubbed Darkwater Crossing formed on the eastern banks of the river, on the southwestern fringe of the Eastmarch bogs. Many consider it a beautiful place, and it has the makings of becoming a proper settlement, though it has many challenges to overcome, not the least of which being that, for most, the journey to reach it is quite hazardous. 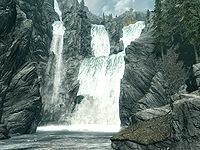 It was just outside this encampment that, in 4E 201, General Tullius of the Imperial Legion staged a successful ambush wherein Ulfric Stormcloak was captured, a victory which would have ended the Stormcloak Rebellion had it not been for the surprise return of Alduin and Ulfric's resulting escape. ^ Sylgja's dialogue in Skyrim. ^ Ralof's dialogue in Skyrim. This page was last modified on 20 December 2014, at 23:57.